AROUND 2,000 Poles took to the fields surrounding Fawley Court in protest at its Ł22 million sale by Polish Catholic priests. The demonstration on Whitsunday was designed to show how Poles feel cheated by the Marian Fathers, who had owned the property since 1953. The Whitsum celebrations continued as normal with a midday mass in St Anne’s Church, which could not hold the entire congregation. Afterwards, people signed a petition against the sale before walking through the grounds, sunbathing and holding barbecues. Ms Karol warned that the sale would be bad for the local economy. She said: “If you look around Henley there are only two stately homes, Fawley Court and Stonor Park. 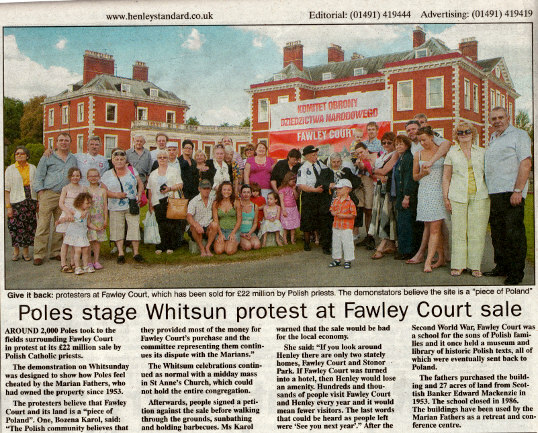 If Fawley Court was turned into a hotel, then Henley would lose an amenity. 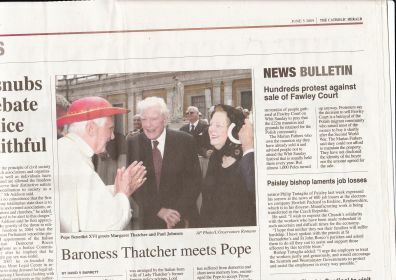 Hundreds and thousands of people visit Fawley Court and Henley every year and it would mean fewer visitors. The last words that could be heard as people left were ‘See you next year’.” After the Second World War, Fawley Court was a school for the sons of Polish families and it once held a museum and library of historic Polish texts, all of which were eventually sent back to Poland. The fathers purchased the building and 27 acres of land from Scottish Banker Edward Mackenzie in 1953. The school closed in 1986. The buildings have been used by the Marian Fathers as a retreat and conference centre. The First Evangelium Summer Conference, sponsored by CTS, has been an astounding success, with young people describing it as ‘the best weekend of my life’, an ‘answer to prayer’ and an ‘inspiration and encouragement’. Over the 8th – 10th August over one hundred young people assembled at the Shrine of the Divine Mercy, Fawley Court, for a series of talks, workshops and other activities addressing the crucial evangelistic question of our time – how to reach out and explain the Catholic Faith to people in the modern world. Speakers at the Conference included CTS authors Prof. Roy Schoeman, Fr Jerome Bertram CO, and Joanna Bogle, as well as Fr Thomas Crean OP, Fr Reto Nay, Fr John Saward, and Walter Hooper. Delegates also represented CASE, Aid to the Church in Need, Family Life International, St Anthony Communications, St Patrick’s School of Evangelisation, the Good Counsel Network, the Iona Institute and the Linacre Centre. Although the topics addressed were often serious, there was also much good humour and a great sense of joy. The liturgy and music were organised by past and present seminarians of the Venerable English College in Rome. Many young people especially praised the love and reverence evident in the celebration of Holy Mass. Many young people left the Conference asking for more and the Evangelium Project is hoping to organise a second Conference in summer 2009. > All of our talks, discussions etc. were permeated by prayer. I’m leaving here rejuvenated both in my own faith and feel more equipped in sharing the riches of the Catholic faith. Please hold another conference next year! > Thank you very, very much - it has been priceless - I would love to come again! God bless you for organising this! > The high point for me was the way Holy Mass was celebrated. So much love and reverence. > Very high quality of speakers - fluent, full of interest and humour, and orthodox. A fine mix of people, all from different background but with an implicit unity of approach to their faith. Very encouraging and inspiring. > It gave me the inspiration and encouragement to challenge myself more, to dive deeper in searching my vocation and courage to be more outward about defending my faith.